I started running in July 2011 during my preparation for the final state exams at the university. Maybe you are familiar with this situation: you do anything, just not study. After passing the exams, I suddenly got free time and decided to start moving. The beginnings was tough, but in October I ran my first quarter marathon. I started to like running more and more, and in January 2012, I did a Couch to 5K and Bridge to 10K programmes that trained me to the level when I could run 10 km in one hour. 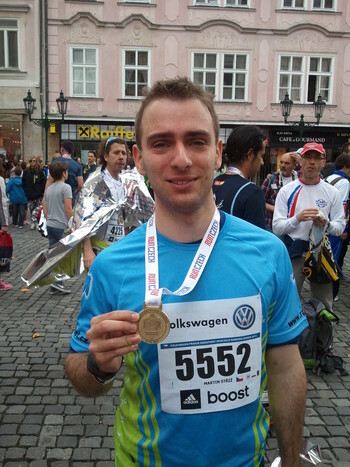 I beat my first half marathon in September in Ostrava with time 1:49, which encouraged me to think about going to marathon. As I wrote in January, I had signed up and then started training for the Prague International Marathon (PIM). The plan was quite clear: four runs per week with increasing load, some fast runs, intervals and also very long runs. Everything was going well until I got ill. I was repeatedly ok and sick and in total missed almost half of the training sessions. I started to feel good again less than a month before the race. I was on the verge of quitting, but thanks to the great support of people around me, I endured and got most of the training in this last month. The race took place on Sunday 12th of May 2013, but I got to pick up my starting number at least the day before. So I booked a hotel and went to Prague, already feeling very nervous. In the expo I got a number (5552), backpack and lots of materials. At the expo many sport companies were selling their stuff like clothes, shoes etc., but I was not in the mood to buy anything. Then I met with my friends, that were also going to run and we went for a dinner together (large bowl of pasta, of course). During the night from Saturday to Sunday I almost could not sleep, mostly because I was very nervous, partly because my hotel room was next to the elevator shaft . In the morning I had a small breakfast (I was not able to eat much) and took a tram to the area of start, where I met the support team, my brother . I gave him a backpack and walked to the corridor „H“ I had been assigned to. I was awaiting the start together with other 9500 runners. The race started at 9:00 sharp with the sound of Vltava. It was very strong and emotional moment, almost indescribable. I felt very glad I was there, that I had made it to the start and that I was running my dream. It took me over six minutes to get to the starting line on the Old Town Square. The view of Pařížská street packed with runners and cheering fans was something I am never going to forget, it was simply astonishing. I was little over-dressed, I had expected between 12 and 15 degrees and cloudy sky. However, just after the race started, the clouds disappeared and Sun started to shine. I rolled up my sleeves, kept running and hoped a cloud would come. I felt hot for the first 5 km or so, but then it started to get windy and it was all right again. The first 15 km were very nice and calm, I was enjoying the run and the surroundings. Then I started to feel my knees, so I sped up a bit and felt comfortable again, with pace between 5:40 and 6:00 (per km). On the waterfront, south of Vyšehrad, it felt like being on a grill. Long, wide road with no shade and no wind. I compensated the heat by drinking more at the refreshment stations. I passed the half marathon mark (21,0975 km) with time 2:05. I still was on the right track to finish with time between 4:00 and 4:15. I made it to the finish line! The first bigger crisis came on the 24th km. My legs hurt a lot, but the feeling I am past the half gave me strength to continue. On 28th km, just before the refreshment station I consumed a energy gel/syrup/who-knows-what that turned my stomach upside down. I almost vomited, but a cup of water calmed things down. From kilometre number 29 I was running on auto-pilot, shutting down the brain and conserving energy. When I passed the sign that stated „30 km“ (time 2:58), I told myself: „now you are further than ever before, keep going“. And I kept going… 9, 8, 7 km to go, the finish line was getting closer and closer. On the 37th kilometre I felt like visiting hell, my legs ached and burnt a lot, I felt sick and dehydrated. The reserves that kept me running for the past 10 km were out and I had to switch to walking. I walked for a minute or so and then ran again, but could not keep the pace for long. I was alternating between walking and running, looking forward to the refreshment station. When I finally got there, I took two cups of water and drank slowly while walking. I managed to start running again, almost to the next (and last) refreshment on the 40th kilometre. I forced myself to eat something, took even more water and gathered some strength for the last two km. There was a tunnel nearby that provided the much needed shade and because of that (and because of the large commercial on its entrance that said „boost your run now“ ) I ran again. Again, the pace did not last long, the tunnel ended with a slope, which was not very steep, but in my condition I felt like rock-climbing. I passed a 41th km sign. People on the side of the road were cheering and encouraging me to run, but I could not, my body refused that. I passed other signs: 900 m, 800 m, 700 m to go… I was almost there. Then, from out of nowhere, a strong push to my back. A nearby runner pushed me and said: „You have to run! Don't stop!“. And I ran. Don't know how, don't know where did the strength come from, cannot explain that, but I ran. The final part was the exact opposite of the starting one: Pařížská street to Old Town Square. The street was full of people as I headed towards the last gate. Blue carpet, finish line… I did it, I could not believe what had just happened. With tears of happiness and pain in my eyes I got my medal. My brother was waiting for me at the end of the finish corridor. I almost wasn't able to speak, but managed to tell him that I need him to take a photo of me . We walked to the technical area, where I got the finish time engraved on the medal and then sat down to KFC, where I drank over half litre of cola to replenish my blood sugar. I turned on my phone and got dozen of messages with congratulations from people that were watching and tracking my progress on-line. Thank you everybody for the support! We stayed in KFC until it was time to get home. He went with me to the train station and made sure I boarded the right train. On the way home, I could not sleep, although I was extremely tired. My mind was occupied, I was replaying the memorable moments from the race and tried to comprehend what I had achieved. I had been a long time since I went on some trip to explore the world. My friend Martin is an exchange student in Jyväskylä, Finland at the moment and invited me to visit him. I accepted and spent very nice two weeks there. The journey there was long, it took the whole day. I took a train from Ostrava to Warsaw and then two flights: from Warsaw to Helsinki and from Helsinki to Jyväskylä. The second flight was my first time in a turboprop airplane (ATR 72). It was small and very noisy and you could feel any small turbulence. I arrived all right . In the morning Martin showed me around the city. We drove to the city centre and to the surrounding lakes. I was not accustomed to the weather and I was freezing, but took a lot of pictures. 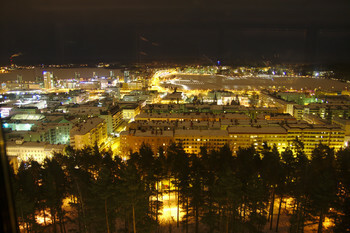 In the evening we went to Finnish sauna (with beer of course) and later we went to the observation tower of Harju, which is on a hill next to the city centre, to take night shots of Jyväskylä. 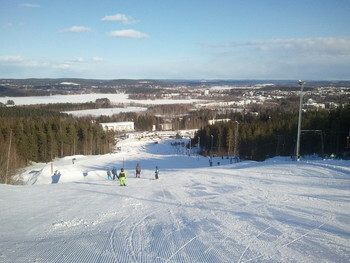 The weather was very nice, two weeks of Sun, blue sky and temperatures around zero. In order to enjoy it together with the Finnish nature, we took a hike in a Leivonmäki national park. I have to say, trails in that national park were for the summer, not winter. Everywhere was about half metre of snow and several times we had to turn around and head back to try another route. In the end, to get back to the car, we had to destroy several hundred metres of cross-country skiing trail to avoid swimming in the snow. Hopefully we met only one skier. As for the sports, I did something almost every day. 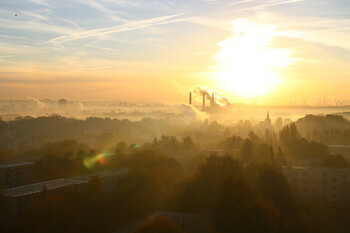 The air was so clear (comparing to Ostrava), that I really had to go outside and breath it as much as possible . Several times I went running. The nature was amazing and running on the frozen lakes is also a unique experience. I also tried skiing. There was a happy-hour offer (3 hours pass + rent of the equipment) that I used two times. I had not skied for two and half years, so in the beginning I was little worried, but in a while I got into it again and enjoyed skiing down the slope. Together with Martin we went bouldering. For Martin it was a first time he had tried it (and he did quite well). Comparing to the boulder I have next to my place in Ostrava, it was much higher, but the floor was also harder. I had to be more careful not to fall down, therefore could not afford to do „risky“ movements I would do otherwise. During Fridays all museums in the city were with free entrance, so we did a „museum run“ through museums of Alvar Alto, Museum of Central Finland and two other, which were all very nice. The museum, which we had visited several days before and where we had spent a long time, was the Aviation Museum of Central Finland. It was a hangar packed with various air planes, parts, weapons, machinery and communication equipment. The most memorable was the possibility to sit into the cockpit of MIG-21 and some model of SAAB. I took a lot of pictures in there, see for yourself in the gallery. Before leaving I bought a lot of souvenirs, mostly candies made of salmiakki (even chocolate and vodka). The vacation was nice (thanks again, Martin), I had a really good time and relaxed a lot. Last year I did not photograph much (or as much as I would like to), but still I had a lot to choose from. While selecting I realized how many awesome things happened during the whole year. Thanks to everyone that helped to make it that way! 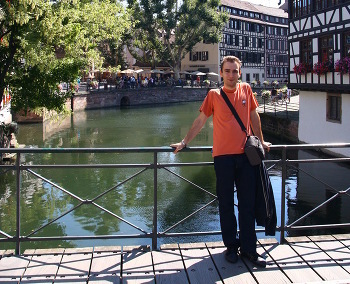 In July Lucia and Carlos packed their things and moved to Strasbourg, France. I was invited to come and visit, which I gladly accepted and, again, spent a marvellous week there (short of a minor food poisoning). It was a very relaxing vacation. See the pictures and perhaps you will agree . Time has finally come and I set off for a journey to London to attend the workshop about Domain Events, Event Sourcing and applying Domain-Driven Design (DDD) taught by the famous Greg Young. I had been looking forward to it very much. and there I was . I found the hotel without any problems and checked in. Without anything to do for the evening, I decided to take a short walk. Seven kilometres and almost three hours later (including a dinner at McDonald's and a pint of ale just before I had reached the hotel) I was back and being exhausted dropped to bed. I needed to rest, the next three days were supposed to be packed with new information. To get to the workshop, I had to take a half of the Circle Line (like 30 minutes ride). It seemed inefficient at first, but when I asked, how to do it better, people told me I made the right choice, because there were no changes and the trains were not so packed. I could even sit down! 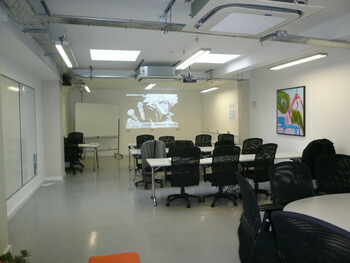 The workshop itself was pretty intensive. The pace and amount of information received was unlike any other lecture I had ever attended. I wish any of the lectures at the university looked like that, maybe I would be sleeping on desks all the time . While going back to the hotel I could not stop my mind from constantly crunching and evaluating the new knowledge. To keep myself busy in other ways, I did some shopping and tried another kind of ale, which made me go to sleep quite early. To go to the place where the workshop took place was very adventurous. At first, I waited for a Cicle Line for over ten minutes and no train arrived. I said to myself that it did not matter and I would take a Victoria Line and change at King's Cross, it even seemed faster. However, they closed the King's Cross station just when I arrived there. It was really a „shortcut“ then, because I had to make two more changes to end up where I wanted to be in the first place (but half hour later). The course was even more intensive than on the first day, my head was totally full after that . All I did on the way to the hotel, except trying other kinds of English ales, was to think about all the questions that had popped in my head. I also thought about going running, but I had to reconsider it because of heavy raining. I was really glad I have bought an umbrella . The last day of the workshop was the day when all bits of pieces should fit together and bring revelation: „Aaah, this is how it is done!“ I must say, it happened to some extent. Lots of issues I had been solving started to seem clear to me, but also lots of new questions appeared. Many of them were promptly answered by Greg, but I think time will show (I mean the near future), whether I comprehended the topics enough or not. In the evening I also attended the Greg's talk about Test Driven Design (TDD) and half of the session of Scala Users Group, both of which were very interesting. The journey home was smooth, I had a lot of time between changes I did not have to hurry. I shortened the waiting by reading Crime and Punishment and was looking forward to the next day when I would go to work and try to apply all the knowledge I accumulated for the past couple of days. This year I finally had the opportunity to attend the annual trip to the town of Říčky in the Eagle Mountains, Czech Republic. In the past years I could not go because of exams. Now, since I do not attend the university any more, I was glad to go again. Since the state holiday on May 8 was Thursday, I took a vacation on Monday and could enjoy four whole days of cycling in the mountains. We came to Říčky on Friday afternoon. I immediately went running to the surrounding trails. It was tough, the terrain was the exact opposite of flat (but what could I expect in the mountains ). On the „day 1“ the weather was excellent, we used the situation and went to the path on a ridge, from where we could enjoy the magnificent views. Next day is was cold in the morning, but clouds started to tear apart and the Sun was shining again. The trip was supposed to be shorter than it had been the day before, but since the weather improved, it was the longest journey during our stay (see attached maps). On the third day we put our stuff to the cars and went to the area of Broumov. The hills were pretty steep there, especially the one right at the start. It would be much more pleasant if the weather were not so cold (like 10 degrees all day). I was shivering through the most of the day :-/. Fourth, and the last, day was easy and relaxing one. We went to Neratov to see a nicely reconstructed church and then straight back, so we could pack our things and head home. The year 2011 was coming to an end and the best opportunity to finish it properly was to celebrate a lot . Me and my friends met in the cottage in the village of Bartultovice. It is a quiet place in the middle of nowhere, very suitable for the loud feast. I think we all had a good time and entered the year 2012 in a good mood. Happy new year! Last weekend my friend and colleague Martin offered me, whether I would like to participate on a trip. His friend Han was exploring Europe and stopped also in Ostrava for several days. They planned a short trip and had one place free in the car. Since I liked the idea of getting out to the fresh air, I agreed. Sunday morning they picked me up at my place and we went to our first stop: the Technical Museum Tatra in Kopřivnice. 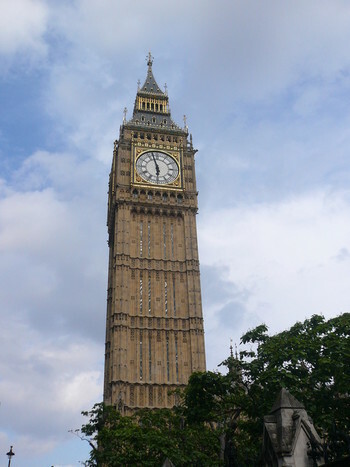 I had visited it before, but since it had been a long time ago, I was very delighted to see it again. The museum has got a large exposition of cars, trucks, airplanes and some special vehicles, all produced by the Tatra factory. When we had enough of cars, we headed to the town of Štramberk, where we climbed up to the castle and then to the top of the castle tower. Although the weather was not so good, the view was quite spectacular (see the pictures). From the castle we hiked to the opposite hill to see the cave „Šipka“. The cave was a place, where Neanderthal had lived many thousands of years ago. 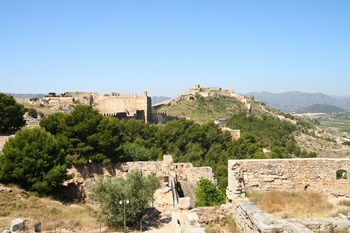 It is a place of many archaeological discoveries. Next stop was the open-air museum in Rožnov pod Radhoštěm. Unfortunately, we discovered it had been closed for the whole month, so we headed to Pustevny, the most famous and visited resort in Beskydy mountains, instead. 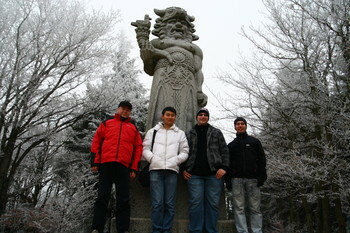 The temperature was below zero with bad visibility, but we had to visit the statue of pagan god Radegast anyway. One and half kilometre there and one and half back, it was not so bad, even in that kind of weather (because it is a stand with hot beverages right next to it ). The resort of Pustevny was the last stop, after that we went back home. I enjoyed the trip very much, saw many places I have not seen for some time and generally had a good time. After sleeping in the smallest hostel room I've ever seen, we went to explore Uppsala. 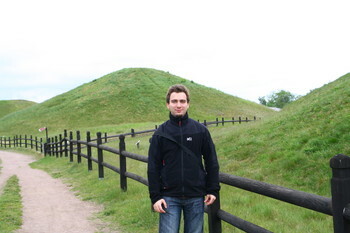 Our first stop was on the outskirts of the city in the village of Gamla Uppsala with its old church and royal mounds. It made a nice place for the morning walk. We also ran through the museum there, but we had not much time, because we decided to see a lot of sights in Uppsala. Returning to the city, first we went to the house and botanical garden of Carl von Linné and continued through the museum of evolution to the tropical greenhouse with many wonderful and sometimes poisonous plants . When we had enough of Uppsala, we took a train back to Stockholm, where we went to see the museums, we have not seen before. The all museums were together in the same area, so it was comfortable to see them all. The first was the Maritime museum where many nice ship models were shown in exposition. Next one was the museum of sport, where we tried our strength, reflexes and balance. Police museum was closed due to fire alarm, so we moved to the next one, the museum of science with its 4d cinema. It was a lot of fun, being punched and sprayed with water by the cinema chair . After visiting all the museums in the area, we went to Skansen again. This time, it was fully open. We saw the marvelous shops and workshops and also the animals in the zoo, which is part of the Skansen. We stayed in Skansen until the evening and then went to the hostel. On the second day we woke up late and headed for the boat that took us to the town of Vaxholm. We marched through the town centre very quickly and took a ferry to the Vaxholm fortress, where we visited another museum focused on the Swedish fortifications. Back in Stockholm we had the last evening in front of us. We decided to thrill ourselves in the amusement park, the Grona Lund. It was not worth to buy a whole-day ticket, so we picked the roller-coasters and a haunted house and bought tickets just for them. The roller-coasters were thrilling, I enjoyed them a lot. The haunted house was a unique experience. Instead of being in the carriage riding in the house, this one was special – you have to walk through it. Everywhere is dark and from time to time a zombie jumps on you . We took one of the last buses from Stockholm to Nykoping airport and slept in the hotel there. In the morning I flew to Warsaw and went home by train, Alina went straight to Vilnius. The long postponed second part of the report from travelling to Nyköping, Stockholm and Uppsala is finally here . We started the day with early breakfast and walk in the Stockholm's Gamla Stan (Old Town) with its narrow streets and picturesque buildings. Almost all museums open at 10 o'clock, so we had plenty of time to go enjoy the atmosphere. Our first stop was the Royal Palace and its museums. We decided to start with visiting the Royal Apartments. It was still too soon so we had to sit down and wait for the opening. During the wait we had a chance to see the changing of the royal guard. We walked through the apartments and continued to the Museum Tre Kronor. The museum is situated inside the cellars of the Royal Palace and it is a part of remnants of the old Tre Kronor castle, which was destroyed by fire in 17th century. The last place of interest in the Royal Palace was the Treasury, where the coronation jewels are kept. The crowns were really nice, just it was a pity no photographs were allowed. The weather was very sunny, but not too hod, just perfect to walk outside. Our next stop was the Drottningholm Palace with its large garden (see the pictures). 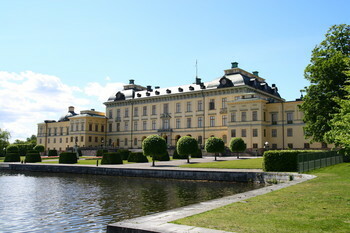 It is a private residence of the Swedish royal family and also an UNESCO World Heritage Site. When we had enough of the palaces and garden, we took a bus back to Stockholm and visited Fotografiska, a new gallery focused on photography. Some pictures were really amazing, I have a lot to catch up, if I want to take pictures like that in the future . The day was not over yet, so we headed to the Kaknästornet, a high concrete lookout tower on the outskirts of Stockholm, from where we could see the whole Stockholm. In order to use the Stockholm card (free museums) as much as possible, we went to the Skansen, which was open to the late evening. However, all historical buildings and attractions were closed there, so we decided to come there again another day. When we came back to the hostel, we were really exhausted and almost immediately fell asleep. The plan for the next day was uncertain, because it started to rain a lot. Fortunately, in the morning the rain started to fade away. We started with one hour sightseeing boat trip and then went to see the City Hall. The next hostel we had had booked was in the city of Uppsala. We took a train there (comparing the train quality to Czech railways, I felt like in a spaceship, not a train ). Since it was afternoon, we did not have enough time to do „proper“ sightseeing, so we just went to visit the Uppsala cathedral and walked in the city centre.